Some interesting things happened in the Office 365 world this week. First, Microsoft announced that message encryption is now being rolled out to customers to fulfil their goal of providing a method to encrypt messages sent to any recipient rather than just within a bounded organization. 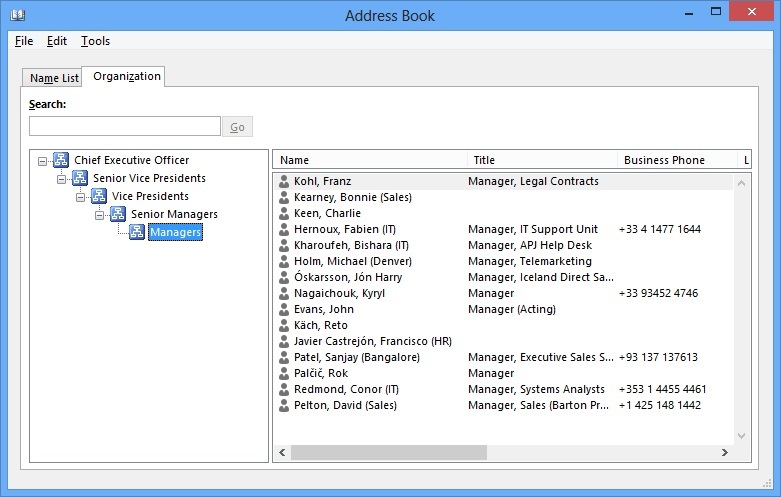 Second, the much-awaited hierarchical address book (HAB) is available to Exchange Online. As always, it’s interesting to poke a little behind the formal announcements and speculate on what value lies for customers in these advances. Office 365 message encryption was originally announced in November 2013. The interval between then and now has been filled with work to prepare the Office 365 infrastructure for the introduction of the new feature, brief the support personnel who will have to deal with customer queries, update online documentation, and so on. I see three critical points that should be understood about Office 365 message encryption. First, the ability to encrypt messages is provided by Windows Azure Rights Management (WARM). This means that you need to subscribe to a plan that can use WARM before you can use Office 365 message encryption. Customers who previously used Exchange Hosted Encryption (EHE) will move automatically to the new service; if you haven’t used encryption services before you’ll need to add WARM to a plan ($2/month/mailbox in the U.S.). The enterprise-focused E3 and E4 plans already include WARM. Subscribers, like me, to the small business plans cannot use WARM and so are out of luck when it comes to encryption [but you can sign up for a free trial of an enterprise plan to test out the new functionality, which is what I did]. The second point is that the content of encrypted messages are sent as protected HTML attachment. Naturally, Microsoft clients do a fine job of opening and processing the protected attachment as planned, which means that they open a browser to invoke an Outlook Web App (OWA)-like interface to expose the content, which is only revealed after the user authenticates themselves by signing in with an Office 365 identity (tenant log-on) or a Microsoft account (LiveID). The identifier needs to correspond with the email address to which the message was sent. Not everyone has one of these identifiers and I assume the intention is that someone who doesn’t will proceed to get a Microsoft account as soon as they start to receive encrypted messages. You can certainly criticize Microsoft for taking this approach to recipient authentication but it’s hard to see what other scheme they could have come up with to allow messages to go to anyone using any other email system. Some ability to customize the instructions (“branding”) provided to recipients is provided through the Set-OMEConfiguration cmdlet. It is possible to include some instructions to recipients in the branding. The requirement to read encrypted messages through an OWA-like interface means that mobile support is only possible for clients that are capable of invoking a browser to run OWA. As explained here, the exact requirement is “Office 365 Message Encryption works on mobile devices as long as the attachment can be opened in a viewer that supports form posts.” Again, everything works perfectly on Windows Phone but I hazard a guess that some iOS and Android clients might run into choppy waters when faced with the need to process that protected HTML attachment. The use of transport rules lends some flexibility to the situation because it is possible to conceive an exception being included in a rule whereby a user could override the organizational policy and send an unencrypted message. However, I can’t imagine many companies allowing this kind of exception. It’s more likely that a rule would be created to look for a keyword in a message subject (like “Encrypt”) and, if the keyword is detected, the message would be encrypted. Protecting messages against those who might pry into their contents is a good thing, especially at a time when we might not trust government agencies to always do the right thing when snooping is concerned. It will be interesting to see how well Office 365 message encryption is received by customers and how widespread its use becomes over the next year or so. If you need more information about setting up the feature, have a look at this post by Jesper Stahle. A feature like this is probably only valuable in large enterprises. Providing a view of company structure is a good thing when there are many operating units with different responsibilities and ever-changing personnel, which is the reason why many enterprises have their own home-brewed version of a tool to navigate the business. However, everyone knows each other in smaller companies and understands where they stand in terms of status and level so the value of these kind of utilities is lessened. And in newer companies, where less importance is given to someone’s position in the hierarchy and their job title and more focus is placed on what they actually do and the success they have had, the availability of the HAB is so-so news. My assumption is that Microsoft has made the HAB possible for Exchange Online customers because some of the larger and more traditional companies want it, perhaps those who are based in regions where a huge import is placed on status and rank. If so, I wish those who implement a HAB well. Just make sure not to attempt to use the HAB with any other client than Outlook 2010 or Outlook 2013. Nothing else works. This entry was posted in Cloud, Exchange, Exchange 2010, Exchange 2013 and tagged Exchange 2010 SP1, Exchange 2013, Exchange Online, HAB, Hierarchical Address Book, Message encryption, Office 365, Outlook Web App, OWA, WARM, Windows Azure Rights Management, Windows Phone. Bookmark the permalink. So what is the purpose of the “Office 365 encryption” if the Vendor (in this case Microsoft) has the keys? They have access to the Data & they can share it with anyone or the Backdoor Access can take care of that. Also per NSA PRSIM documentations, Microsoft has shared the encryption keys with NSA. According to Microsoft General Counsel Brad Smith, backdoor access does not exist. You’re reading (I think) too much into the PRISM stuff. See http://redmondmag.com/articles/2013/12/05/microsoft-to-add-data-encryption.aspx for the plans that Microsoft has to protect Office 365 and other data from government snooping. The questions is, if MS saying they are encrypting, who will have the keys? Agree with John, if the Vendor (Microsoft) has/keep the keys this Encryption is Worthless & just a Marketing. I disagree. You make the assumption that the vendor would misuse the keys for their advantage. Doing so would undermine and break their business and is therefore not in their interest. The same assertion holds for handing over keys to a government (which might happen under the weight of legislation, in which case you’d hope that the access would be controlled). I do not see that Microsoft is proposing a 100% guaranteed “we will always keep your email secret” service here. I think they are providing “much more secure email than the normal unencrypted stuff people send.” As such, I welcome the development, even with the caveats I have expressed. Personal users can protect their email as they want using S/MIME, PGP, or whatever mechanism they select (as you might do with Gmail or Yahoo! Mail); the decision to use something like Office 365 message encryption is driven by companies who will make their own choice about whether policy-driven protection like this is sufficient for their needs. I have to agree with John here. If the Vendor (Microsoft) has the Keys for the encryption this service is worthless. As said before in the NSA PRISM, Microsoft shared the keys. Yep, Agree with John. The Vendor (Microsoft) has the keys and they can share it with NSA as the Vendor has done before according to the news. This all Marketing……………..
Every service that offers this type of encryption solution controls the keys, of which there are quite a few at this point. If I’m correct I believe the underlying technology for this encryption is provided by Voltage (understanding how the technology works will help). I might actually argue that it’s safer for Microsoft to maintain the keys than the business/customer. If I have to control the keys how are they being kept safe? It’s making the assumption that having the keys on premise is safer than Microsoft having the keys. I would bet that most businesses can’t come close to having the level of security that MS or many of the other vendors has. It’s like arguing that storing my 100k is safer at my house in my safe because I have the key then it is at the bank where they have the key. Not to mention the fact that in a breach scenario Microsoft holds a level of liability that I’m sure they would not want to test. If you are really concerned about security the NSA will be the least of your worries.